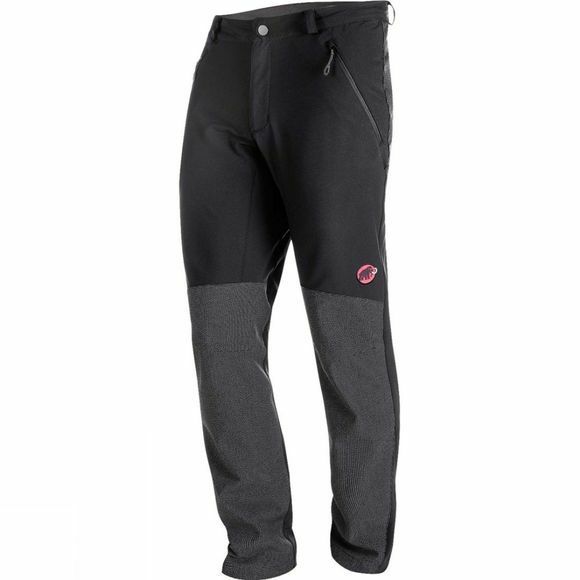 The Men's Base Jump SO Pant from Mammut are a water repellent stretch pant with robust abrasion-resistant elastic Cordura added to exposed areas. Fit has been considered as a gusseted crotch allows a greater freedom of movement, as do that preformed knees which have been constructed so that the knee can bend in its natural position. To further enhance the fit belt loops have been used so that the pant sit comfortably at the waist of the active fitting Base pant. There is plenty of storage available too with two zipped hand pockets ideal for essentials, a large leg pocket that is suitable for a map, and also a zipped rear pocket is plenty big enough for a bank card or some keys so you will have all bases covered.